Deadwood fans have been teased by rumors and malarkey about a final season or a movie that would tie up the loose ends of the series, for years. Back in 2015, the whispers about a Deadwood movie going into production grew from whispers to a quiet mumble. Then, in 2017, Deadwood creator David Milch said that he'd completed a script that'd appeal to the show's followers and new viewers alike. Fast forward one more year to 2018: a whole twelve years after the last episode of season three went to air. According to The Hollywood Reporter, HBO has finally announced that production on a Deadwood movie will start this October. Tell your God to prepare for blood! If you're not familiar with the show, love blood, excellent writing, complex characters and dark humor, you need to get on it. During its three-season run, Deadwood chalked up eight Emmy Awards for its portrayal of the life and drama surrounding the citizens of Deadwood, South Dakota in the 1870s. While the show's roots are rooted in the Old West, at a time when outlaws and gunfighters still held sway, the story lines covered over the series' 36 episodes are more Shakespearean in scope than Spaghetti Western. 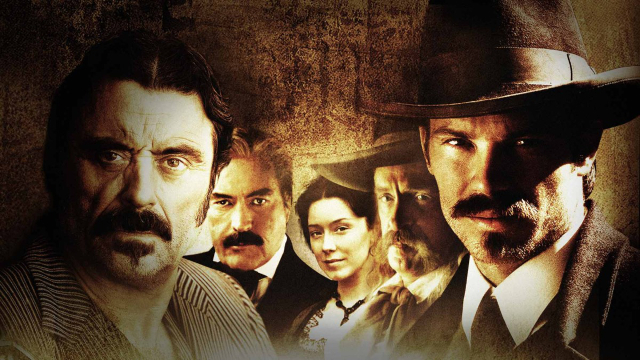 If Deadwood sounds like your thing, you're in luck: it's currently streaming on HBO Go, Amazon Prime Video, and can be bought outright on iTunes, Google Play or as a DVD or Blu-ray box set from Amazon for under $50.